one of the many highlights of our trip to london, aka. lundy town was the yogurt parfaits that were brought to our door every morning at the hoxton hotel. each day we would jump out of bed (well, maybe it was more of a saunter) and make our way to the door, grab our goodie bag (discard the orange juice — too, pulpy) and happily dig in to the layers of fruit, yogurt and granola. when we got back home to los angeles, i found myself craving the flavors, so i did what any rational person would do. spent several hours researching granola recipes, experimented a bit and came up with a recipe i liked. oh, and yes, i know a rational person would just go to the store and buy a parfait…turns out, i’m not rational. * 1/3 cup coarsely chopped almonds (i used roasted, but you are popping them in the oven, so raw might be just fine). * in a medium bowl whisk the honey, butter, brown sugar and vanilla. also known as mixture “b.” this, i warn you is not too much fun. * using those pretty hands of yours, convincingly combine mixtures a & b. oh, and be sure to leave some of it clumpy. this is one time where clumps are good! * spread the mixture evenly onto a parchment paper lined baking sheet and pop it in the oven for ten minutes. • throw the berries, water, sugar and zest into a saucepan over high heat and bring to a boil. • once at a boil, lower to medium-low heat, stir occasionally and watch how it turns into a beautiful berry filled purple syrup. • you’ll be done in about 8 minutes, then transfer the goodness to a bowl and set aside to cool. • get in there with a spatula and flip the granola so that it is cooking evenly. * sprinkle the almonds over the top and pop it back in the oven for another ten to fifteen minutes. * remove from oven and let cool. ps. 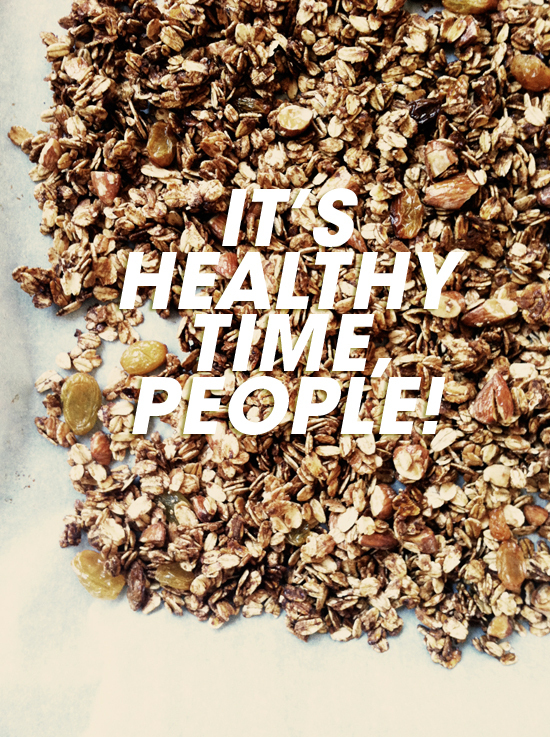 at times during the process it might seem like your granola is not getting crispy . . . but it will, i assure you, it will. • so at this point, hopefully you have invited over 5 friends, cause you got parfait fixins for six. • add a few spoonfuls of fruit to each glass and be sure to get some of that purple syrup along with it. * arm yourself with a spoon and start stirrin’ and smashin’! it won’t be pretty, but it will be delicious! Good call. I rotate smoothie / steel cut oats / eggs for breakfast everyday. Seriously. Everyday for the last two years. I need some serious variety. This looks amazing! I’m going to make it for my best when she visits next week. I am definitely going to give this a go–it is about time I mixed breakfast up a bit. It’s so fun taking the memory of a special vacation treat and turning it into a ritual at home. The parfait looks delicious- love the blueberry! Waking up at six a.m. each day, I never have much ambition to make a really tasty breakfast. But with this recipe, I might actually take the time! It looks absolutely delicious!! Looks yummy! Thanks for this! oh man, I’m eating oatmeal right now. this sounds so much better. Oh yum, this looks incredible, Jen! Is it me or does yogurt has a weird density. It’s cute how you say “healthy time!” then say 1/4C of sugar – But that’s OK, we know we can omit that part if we’re watching what we eat. 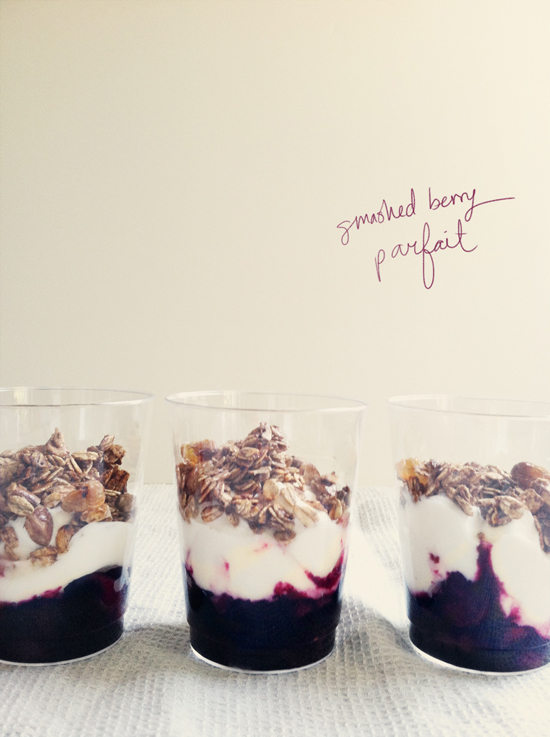 I love parfaits and will definitely have to give this granola recipe a try! They look so yummy! For some reason, the smashed berries make this so much fancier. Gotta try it! Yum!! I love granola and I love yogurt. This looks like perfection to me. Thanks for the recipe! yummy! perfect for a sunday brunch with friends. this might just be what i need to get on my track to a healthy me. Yum, yum! This sounds like the perfect morning for a budding spring day! Can’t wait to try it with lots of fresh berries that will be popping up soon! I’ve been making little parfaits and placing them in jars for breakfast on the go.. digging this recipe! Will try it out! YES! Thank you. How crazy that you posted this — I, too, have recently spent countless hours researching granola recipes! I absolutely love nut & fruit parfait so I am anxious to try your recipe. Yay, thanks for sharing, Bri. 🙂 Looks delish. amazing combo! i love making granola. Just lovely! I shall be bookmarking this for future reference! First off, love Jen Gotch. Such a fannnn! And, this looks so yummy. I stayed at the Hoxton when I was in London last year! Love that hotel…and the breakfasts on the door were such a treat! I am totally making this parfait this weekend! OJ was “too pulpy” so you discarded? Sorry but..tsk tsk at the waste. You should’ve given it to someone who was really hungry. That sort of thing makes me sad! I love your blog, but it’s disheartening to hear about wasting being “cool”. Made it! Love it! Will be making it again very soon! Thanks for sharing! Totally tried just the granola the other night, and it was a pretty good first try. I think next time I will need to go with a little more of the honey mixture, so that I get more clumps. Yummy! I think I’d love this because I love granola bars. P.S. I made these for our dinner party last night. Best dessert ever. I’m going to have to start making that granola regularly. The salt is a game changer.